Welcome to the engagement party of Buffy Chamois Ragsdale and Seth Poole. Miss Ragsdale is the daughter of textile magnate, Dusty Faircloth Ragsdale, and the late Muffy Glovestadt Ragsdale. Seth Poole is the son of Mr. and Mrs. Wade N. Poole. Expected guests include the distinguished Archeology professor, Dr. Doug Groundbreaker. Security is expected to be tight as rumor has it that some not-so-welcome guests could try to gain admittance to this, the social event of the year. Mr. Ragsdale has requested that all invited guests be on the look out for any suspicious looking characters. 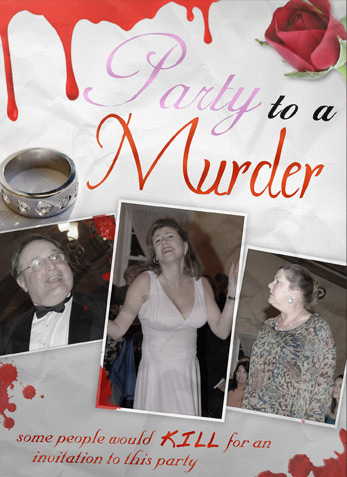 Join us in a toast to the couple of honor...after all, some people would kill for an invitation to this party! Parties are usually such happy occasions, but sometimes there are things that can put a damper on the festivities...like when unexpected guests show up...like when deep dark secrets are revealed...like when someone is murdered! It will be up to you and your table of fellow sleuths to discover who the perpetrator...or perpetrators might be. So, think of a clever name for your "detective agency" and listen carefully as events unfold. At the designated time, your agency will be asked to formulate a question that your delegated chief detective will ask a suspect. Once all tables have completed their questioning, each detective agency will submit a solution sheet indicating "who done it" and why. The first agency to name the most correct culprit and motive wins. Buffy has spent her life in the lap of luxury, being doted on by her father and being treated like royalty. She has dreamed of finding love again after the loss of her first husband, and tonight brings that vision one step closer...it is her engagement party to her chosen Prince Charming, Seth Poole. Will it be the fantasy she longs for, or will she become engaged in a nightmare? Former pool boy, present fiance of Buffy Chamois Ragsdale. He would make quite a splash in the tranquil pool of the Ragsdale dynasty if anyone in Buffy's social circles knew of his former profession. Will he wave good-bye to trouble? Will he need a lifeguard? Will his past paddle into the present and drown out his future? This widowed "Textile King" has run the family business for years and has turned it into the leading mill in the Southeast. He is a shrewd businessman, but has always placed the well-being of his only child, Buffy, first. She is his little princess and nothing is too good for her. Will his textile business unravel? Will he be a material witness or will his riches turn to rags? Well-respected Archeology professor and godfather of Buffy Ragsdale. Doug has buried himself in his work, going from one excavation to the next...always digging, always studying. What is he searching for, or, what is he hiding from? Will the truth be unearthed tonight? Will he take a dirt nap, or will he be the one covering up his tracks? Hairdresser/manicurist at the Kurly Kue Beauty Salon and close personal "friend" of Dusty Ragsdale. She has designed Dusty's hairstyle for a year and a half and also has designs on the rest of his empire. You could say she's "dyeing" to make their arrangement "permanent"! Will Dusty give her the brush? Will somebody nail her, or will she polish somebody off? Heiress to the Posies R Us floral empire who "petaled" more than flowers before her marriage to Dusty Ragsdale eight years ago. Never the shrinking violet, Camilla planted herself firmly in the social scene of the Triangle. However, in recent years her life has been no bed of roses. Will this water lily stay afloat, or will she soon be pushing up daisies? Hired by Dusty to keep an eye on things at the party and to investigate some questionable characters, he didn't expect to be involved with a murder investigation as well. What exactly did he uncover in his search for the truth? Wedding planner to the rich and richer. Hired by Buffy to plan the perfect engagement party and wedding, she didn't expect to be involved with a murder investigation as well. What exactly did she uncover in her search for the truth?